This compact, lightweight UV cabinet will accommodate TLC plates up to 20x20 cm. It comes complete with a 4-watt combo UV lamp (254nm & 366nm). 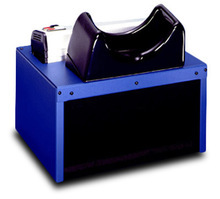 The UV lamp is removable and may be used separately, for example. for viewing freshly sprayed plates without removing them from the fume hood. Access to the interior of the cabinet is via a flexible, dark curtain on the front of the cabinet. The contoured viewing port contains a built-in contrast filter which absorbs both UV light and "blue Haze" for safe viewing without eye fatigue. Typical light intensities at the cabinet floor are 300 μW/cm2 at 365 nm and 310 μW/cm2 at 254 nm. This cabinet/lamp system is also available with a 6-watt lamp also (Catalog # 93-06).